Technical Car Experts Answers everything you need: No brake pressure on Pontiac Sunfire? No brake pressure on Pontiac Sunfire? Do not place your foot on the brake pedal through this entire procedure unless specifically instructed to do so. This method can only be used if the ABS warning lamp is not illuminated and not DTC's are present. Start the engine and allow it to run for at least 10 seconds while observing the ABS warning lamp. If the ABS warning lamp turned ON and stayed ON after about 10 seconds, the bleeding procedure must be stopped and a Tech 1® must be used to diagnose the ABS function. If the ABS warning lamp turned ON for about 3 seconds, then turned OFF and stayed OFF, turn the ignition OFF . Repeat Steps 1-4 one more time. The entire brake system should now be bled by following the guide or pressure bleeding procedure. Clean the master cylinder fluid reservoir cover and surrounding area, then remove the cover. Add fluid, if necessary to obtain a proper fluid level, then put the reservoir cover back on. Attach a bleeder hose to the rearward bleeder valve, then submerge the opposite hose end in a clean container partially filled with clean brake fluid. Slowly open the rearward bleeder valve. Depress and hold the brake pedal until the fluid begins to flow. Close the valve, then release the brake pedal. Repeat Steps 3b-3d until no air bubbles are present. Relocate the bleeder hose to the forward hydraulic modulator bleeder valve, then repeat Steps 3a-3e. Once the fluid is seen to flow from both modulator bleeder valves, the ABS modulator/master cylinder assembly is sufficiently full of fluid. However, it may not be completely purged of air. At this point, move to the wheel brakes and bleed them. This ensures that the lowest points in the system are completely free of air and then the assembly can purged of any remaining air. Remove the fluid reservoir cover. Fill to the correct level, if necessary, then fasten the cover. Proceed, as outlined in the following steps, to bleed the wheel brakes in the following sequence: right rear, left rear, right front, then left front. Attach a clear plastic bleeder hose to the bleeder valve at the wheel, then submerge the opposite hose end in a clean container partially filled with clean brake fluid. Have an assistant slowly depress the brake pedal. Close the valve and slowly release the release the brake pedal. Repeat Steps 7a-7e until the brake pedal feels firm at half travel and no air bubbles are observed in the bleeder hose. To assist in freeing the entrapped air, tap lightly on the caliper or braking plate to dislodge any trapped air bubbles. Repeat Step 7 for the remaining brakes in the sequence given earlier. Remove the reservoir cover, then fill to the correct level with brake fluid and replace the cap. Attach a clear plastic bleeder hose to the rearward bleeder valve on the modulator, then submerge the opposite hose end in a clean container partially filled with clean brake fluid. Have an assistant depress the brake pedal with moderate force. Slowly open the rearward bleeder valve and allow the fluid to flow. Repeat Steps 11a-11e until no air bubbles are present. Relocate the bleeder hose to the forward hydraulic modulator bleeder valve, then repeat Steps 11a-11f. Carefully lower the vehicle, then check the brake fluid and add if necessary. Don't forget to put the reservoir cap back on. With the ignition turned to the RUN position, apply the brake pedal with moderate force and hold it. Note the pedal travel and feel. If the pedal feels firm and constant and the pedal travel is not excessive, start the engine. With the engine running, recheck the pedal travel. If it's still firm and constant and pedal travel is not excessive, road test the vehicle and make sure the brakes are operating properly. With the Tech 1® scan tool, Release then Apply each motor 2-3 times and cycle each solenoid 5-10 times. When finished, be sure to Apply the front and rear motors to ensure the pistons are in the upmost position. DO NOT DRIVE THE VEHICLE. If a Tech 1® scan tool is not available, remove your foot from the brake pedal, start the engine and allow it run for at least 10 seconds to initialize the ABS. DO NOT DRIVE THE VEHICLE. After 10 seconds, turn the ignition OFF . The initialization procedure most be repeated 5 times to ensure any trapped air has been dislodged. Repeat the bleeding procedure, starting with Step 1. Road test the vehicle, and make sure the brakes are operating properly. Get an assistant to pump the pedal gently as you open the bleeder, leave it open and put your finger over the bleeder, do this with the key "OFF" Do not allow the master to run dry! Also, the right rear and left front are paired as this car has a diagonal brake system. Bleed both! Get fluid to the rear wheel first. BLEEDING BRAKE SYSTEM NOTE: If any brake component is repaired or replaced and air is allowed to enter system, entire bleeding procedure must be followed. Use only DOT 3 brake fluid from a sealed container. Protect vehicle exterior paint and electrical components from possible brake fluid spillage. PREFERRED METHOD Before bleeding system, using scan tool, place hydraulic ABS modulator/motor pack assembly displacement cylinder pistons in upper position. 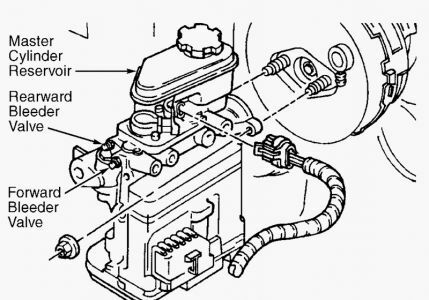 To position pistons, connect scan tool to Data Link Connector (DLC), and then select F5: MOTOR REHOME. Motor rehome cannot be performed if any current Diagnostic Trouble Codes (DTCs) are set. Diagnose and repair DTCs. See DIAGNOSIS & TESTING . Bleed entire system using either MANUAL BLEEDING or PRESSURE BLEEDING procedure. If scan tool is not available, alternate method may be used. See ALTERNATE METHOD procedure. ALTERNATE METHOD CAUTION: DO NOT use alternate method if ABS warning indicator is illuminated and DTCs are set. Follow procedure exactly, DO NOT place foot on brake pedal unless directed to do so. With foot off brake pedal, start engine and run for at least 10 seconds while observing Amber ABS warning indicator. If ABS warning indicator illuminates and remains illuminated after 10 seconds, DO NOT bleed brakes. Scan tool must be used to diagnose ABS malfunction. 1. If ABS warning indicator illuminates for about 3 seconds and then goes out, and remains off, turn ignition off. Repeat procedure a second time. If ABS is okay, bleed entire system using either MANUAL BLEEDING or PRESSURE BLEEDING procedure. 2. MANUAL BLEEDING ABS Modulator Assembly (Priming) Clean master cylinder reservoir cover and surrounding area. Remove reservoir cap. Ensure reservoir is full. Install reservoir cap. Attach a clear hose to rear bleeder valve and submerge other end of hose in a container of clean brake fluid. See Fig. 1 . Slowly open rear bleeder valve. Depress brake pedal until fluid begins to flow. Close valve and release brake pedal. Repeat procedure until no air bubbles are seen in hose. Repeat procedure for front bleeder valve. TCS Modulator Assembly (Priming) Clean master cylinder reservoir cover and surrounding area. Remove reservoir cap. Ensure reservoir is full. Install reservoir cap. Remove TCS modulator assembly bolt to bracket to access bleeder valves. Attach a clear hose to right side bleeder valve and submerge other end of hose in a container of clean brake fluid. Slowly open right side bleeder valve. Depress brake pedal until fluid begins to flow. Close valve and release brake pedal. Repeat procedure until no air bubbles are seen in hose. Repeat procedure for left side bleeder valve. Brake Caliper/Cylinder (Bleeding) Clean master cylinder reservoir cover and surrounding area. Remove reservoir cap. Ensure reservoir is full. Install reservoir cap. Raise and support vehicle. Attach a clear hose to specified bleeder valve and submerge other end of hose in a container of clean brake fluid. Bleed brakes in the following sequence: 1. Right Rear â€¢ Left Rear â€¢ Right Front â€¢ Left Front â€¢ Open bleeder valve. Slowly depress brake pedal. Close bleeder valve and slowly release brake pedal. Wait 5 seconds and repeat process until brake pedal is firm and no air bubbles are seen in hose. Tap lightly on caliper or backing plate to free trapped air. Repeat procedure at remaining bleeder valves. Ensure reservoir is full. Bleed ABS modulator assembly. 2. ABS Modulator Assembly (Bleeding) Ensure reservoir is full. Attach a clear hose to rear bleeder valve and submerge other end of hose in a container of clean brake fluid. See Fig. 1 . 1. Depress and hold brake pedal. Slowly open rear bleeder valve and allow fluid to flow. Close valve and release brake pedal. Wait 5 seconds, repeat procedure until no air bubbles are seen in hose. Repeat procedure for front bleeder valve. 2. TCS Modulator Assembly (Bleeding) Ensure reservoir is full. Attach a clear hose to right side bleeder valve and submerge other end of hose in a container of clean brake fluid. 1. Depress and hold brake pedal. Slowly open right side bleeder valve and allow fluid to flow. Close valve and release brake pedal. Wait 5 seconds, repeat procedure until no air bubbles are seen in hose. Repeat procedure for left side bleeder valve. 2. Completing Bleeding Procedure Lower vehicle. Ensure reservoir is full. Turn ignition on, with engine off. Apply moderate force to brake pedal, noting travel and feel. If pedal is firm and travel is not excessive, start engine and recheck. If okay, go to step 4). If pedal feels soft or has excessive travel, go to next step. 1. Using scan tool, release and then apply each ABS motor 2-3 times, and cycle each ABS solenoid 5-10 times. When finished, apply front and rear motors to return pistons to upper position. DO NOT drive vehicle. Repeat manual bleeding procedure. 2. If scan tool is not available, with foot off brake pedal run engine for at least 10 seconds to initialize ABS. DO NOT drive vehicle. After 10 seconds, turn ignition off. Repeat procedure 5 times to ensure trapped air has been dislodged. Repeat manual bleeding procedure. 3. Road test vehicle, making several normal (non-ABS) stops from a moderate speed. 4. PRESSURE BLEEDING Beginning Bleeding Procedure Clean master cylinder reservoir cover and surrounding area. Remove reservoir cap. Ensure reservoir is full. Attach Bleeder Adapter (J-35589) to reservoir. Attach bleeding equipment and pressurize system to 5-10 psi (.35-.70 kg/cm 2 ) for 30 seconds to ensure there are no leaks. Slowly increase pressure to 30-35 psi (2.1-2.4 kg/cm 2 ). ABS Modulator Assembly Attach a clear hose to rear bleeder valve and submerge other end of hose in a container of clean brake fluid. See Fig. 1 . Slowly open rear bleeder valve. Allow fluid to flow until no air bubbles are seen in hose. Close valve and repeat procedure for front bleeder valve. 1. CAUTION: DO NOT allow brake fluid to contact motor pack or electrical connectors. Premature failure of motor pack may result. To bleed modulator at brake pipe connections, position shop towel below brake pipes. Using flare wrench, slightly open forward brake pipe fitting at ABS modulator assembly. Allow air to escape and then tighten fitting. Bleed remaining brake pipe connections at ABS modulator assembly from front to rear. 2. TCS Modulator Assembly Remove TCS modulator assembly bolt to bracket to access bleeder valves. Attach a clear hose to right side bleeder valve and submerge other end of hose in a container of clean brake fluid. Slowly open right side bleeder valve. Allow fluid to flow until no air bubbles are seen in hose. Close valve and repeat procedure for left side bleeder valve. 1. CAUTION: DO NOT allow brake fluid to contact motor pack or electrical connectors. Premature failure of motor pack may result. To bleed modulator at brake pipe connections, position shop towel below brake pipes. Using flare wrench, slightly open right side brake pipe fitting at TCS modulator assembly. Allow air to escape and then tighten fitting. Bleed remaining brake pipe connections at TCS modulator assembly from right to left. 2. Brake Caliper/Cylinder Raise and support vehicle. Attach a clear hose to specified bleeder valve and submerge other end of hose in a container of clean brake fluid. Open bleeder valve. Allow fluid to flow until no air bubbles are seen in hose. Tap lightly on caliper or backing plate to free trapped air. Close valve and repeat procedure on remaining bleeder valves: Right Rear â€¢ Left Rear â€¢ Right Front â€¢ Left Front â€¢ Completing Bleeding Procedure Lower vehicle. Remove pressure bleeding equipment and check reservoir level. Turn ignition on, with engine off. Apply moderate force to brake pedal, noting travel and feel. If pedal is firm and travel is not excessive, start engine and recheck. If okay, go to step 4). If pedal feels soft or has excessive travel, go to next step. 1. Using scan tool, release and then apply each ABS motor 2-3 times, and cycle each ABS solenoid 5-10 times. When finished, apply front and rear motors to return pistons to upper position. DO NOT drive vehicle. Repeat pressure bleeding procedure. 2. If scan tool is not available, with foot off brake pedal run engine for at least 10 seconds to initialize ABS. DO NOT drive vehicle. After 10 seconds, turn ignition off. Repeat procedure 5 times to ensure trapped air has been dislodged. Repeat pressure bleeding procedure. 3. Road test vehicle, making several normal (non-ABS) stops from a moderate speed. 4. Fig. 1: ABS Modulator Assembly Front & Rear Bleeder Valves. Labels: How to bleed brakes on Pontiac Sunfire.